That’s right! 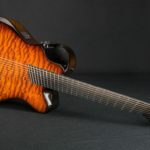 Guitar number 5000 was the momentous milestone reached at the Emerald Guitars factory on February 27th, 2019. Last year, Emerald Guitars celebrated 20 years since Alistair Hay built his very first Emerald guitar. That was a significant landmark in Emerald’s history — 20 years of dedication to perfecting the art form that captured his heart so many years ago. Emerald has now built its 5000th guitar — a 5-string Balor bass featuring a Pau Ferro wood veneer. Reflecting on the long, remarkable journey, Emerald is excited to continue innovating and refining over the course of the next 5000 instruments. During Emerald’s very first year, I built two guitars. The following year, I built four. And so continued the slow but methodical growth to build what Emerald Guitars is today. In truth, I have rarely paid much attention to the number of guitars built, rather focusing on always trying to make the next guitar the best guitar. But this focus on quality, innovation, and improvement has paid dividends, and I count it an incredible privilege that so many people from all around the world have chosen us to build them a guitar. Back in January when I was doing production planning I realised serial number 5000 was coming up, so I thought we should mark the milestone in some way. The first decision was to choose which instrument Emerald should build to represent its 5000th guitar. Well, that was easy! The 5000th should be a 5-string Balor bass! The next decision was to choose the colour and finish; that was a harder one. I knew I wanted to choose one of our custom wood veneers, but anyone who has seen our huge collection of veneers knows there are enough choices to make your head spin! In the end, the choice came down to either our newly acquired Quilted Maple or our very unique Pau Ferro. The Pau Ferro won me over with its beautiful, warm colouring and unique pattern. Once the Pau Ferro veneer was decided, the job order was created and passed on to our production team. That’s the last I thought of the milestone until the next month. On February 27th, we were filming the first of our Oakfest music videos in Oakfield Park. Our scheduled act didn’t appear for the recording session, so at the last minute, I called my cousin, Stevie Hay, and his band mate, Gareth McKane, from the group “Bring your Sisters.” They kindly agreed to step in on short notice. But, we needed a bass for Gareth. I drove the short 5 miles back to the factory and walked into the finishing room to see what Balor basses might be available. Coincidentally, Shane was in the process of putting the last string on guitar number 5000 — the Balor bass with the Pau Ferro veneer. Within ten minutes, I was driving out the gate with the milestone instrument. It was perfect timing and such a special way to mark the occasion. 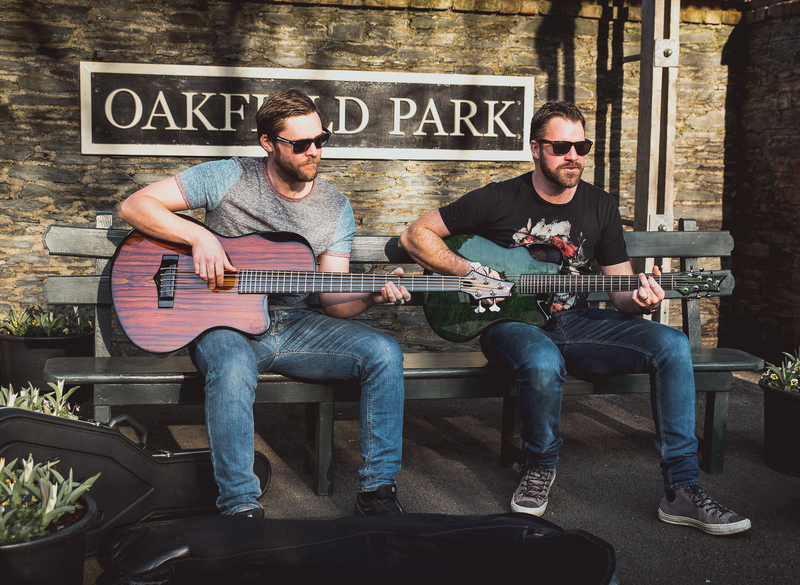 We filmed the duo (Gareth on the Balor, and Stevie on our March Select Series X20) singing and playing on the station platform of the mini railway that runs through Oakfield park, and we were treated to the warmest February day on record. As I stood there, watching them play, I was filled with pride and reflected on the long journey we’ve been on to reach this point. But I also started to look forward, and the future excites me. Our best guitars are yet to be built, and something tells me it won’t take 20 years to build the next 5000 guitars. To learn more and purchase this 5-string Balor bass featuring a Pau Ferro wood veneer, visit EmeraldGuitars.com/product/balor-pao-ferro-5000/.